In comparison to much of the world, Seattle’s safety net for companion animals is world-class. Rescue and adoption groups work tirelessly to find homes for thousands of pets every year and animal-rights groups fight for the less-protected farm animals and captive wildlife. But worldwide, the picture is not always as ideal, and several organizations in Seattle are finding ways to help animals internationally. Eileen Weintraub, the founding director of Help Animals India, works on a volunteer basis. This Seattle-based, nonprofit animal-rescue, rehabilitation and educational organization provides critical services for India’s animals by funding and advising Indian animal welfare groups. Help Animals India helps develop and fund a network of animal organizations, like the Visakha Society for the Protection and Care of Animals (VSPCA) and JBF (Just Be Friendly), to provide services, from saving orphaned baby monkeys to serving vegan meals to the poorest people to disaster relief from floods and cyclones. Veterinary experts working with Help Animals India have taught shelters to implement puppy quarantines for the first time and have trained staff to spay/neuter. 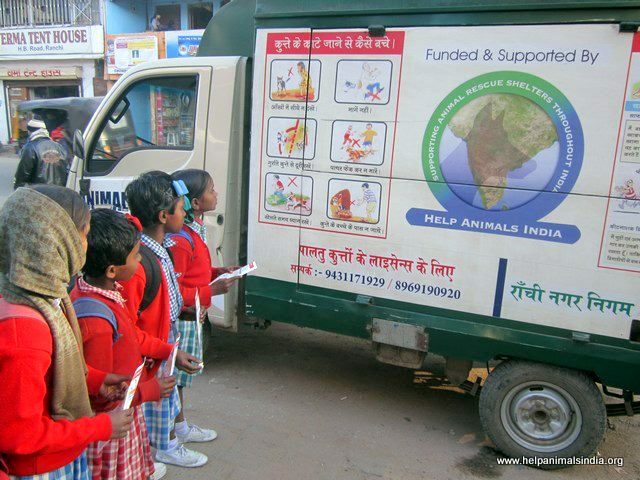 Help Animals India also coordinates volunteers and veterinarians-in-training to work at Indian animal shelters. The concept of animal shelters is not new in India because of the culture of Ahimsa (against killing) in the predominantly Hindu culture. Unfortunately, this often translates as benign neglect of animals, and the means to protect dogs, cats, elephants, cows, monkeys and more is extremely limited. By donating to Indian animal-rescue groups, American funds may go 10 times further because of the strength of our currency in India, Weintraub said. People who travel to India for yoga training or tourism often want to rescue the suffering street animals they see, but they don’t know where to start. “It’s our job to educate and inspire,” Weintraub said. Help Animals India makes it possible to help animals a half a world away; learn more at www.helpanimalsindia.org. Seattle’s helping hands can touch many places around the world, and PAWS is caring for a few Iranian dogs right here at home. Kay Joubert, PAWS’ director of Companion Animal Services, explained that while they always aim to help local dogs first, they also work with the Vafa Animal Shelter in Iran to bring dogs to the Seattle area. A volunteer for the Vafa Animal Shelter arranges for Iranian dogs to accompany a volunteer human traveler between Tehran and Seattle. Upon arrival, PAWS places the animal in a temporary quarantine, as required by the USDA, and then the animal is adopted by a family in the Seattle area. 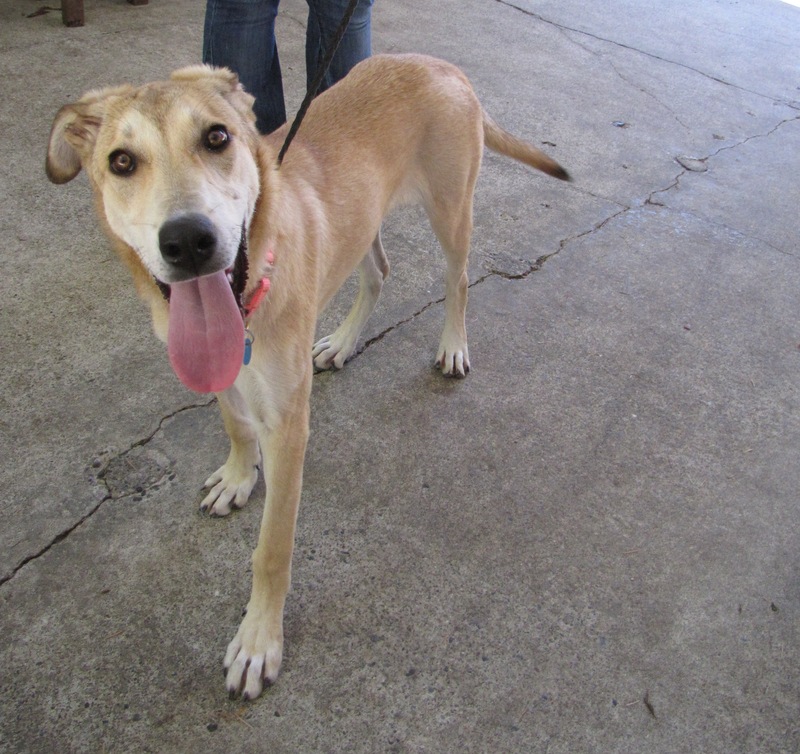 Chelsea, an Anatolian shepherd-cross, made it to Seattle, thanks to Vafa and PAWS, and she is now awaiting adoption. Joubert explained that dogs as companions is much less common in Iran. As a result, rescue dogs need to learn about walking on a leash and living in a house, although they tend to be well socialized with other dogs because they lived in groups in Iran. PAWS is expecting two more Iranian arrivals in October. While rescue is an important part of animal welfare, the Sea Shepherd Conservation Society (SSCS, www.seashephard.org) has traditionally worked on prevention of harm to marine life. SSCS started in the Pacific Northwest in 1977 to take on some of the world’s most egregious abuses of marine life. Among other issues, SSCS addresses crimes such as whaling, baby seal hunts and dolphin hunting by sailing to places such as Japan, the South Seas and the Canadian North to take direct action against pirates and government fleets who are killing of wildlife. SSCS is known worldwide for successes such as recently stopping the needless slaughter of pilot whales in the Faroe Islands, showing once again why “sea shepherd” is such an appropriate name. Since its inception, SSCS has grown into a worldwide network of marine animal protection groups and has recently organized On-Shore Volunteer (OSV) efforts for individuals who apply to become part of the Sea Shepherd crew. Suzanne West is the Seattle chapter coordinator for SSCS, and she currently manages about 20 OSVs in the Seattle area. These volunteers raise awareness of SSCS’s work and fundraise to support direct action for animals worldwide. “We are looking for people who have a passion for the ocean,” said West, who explains that the best way to get involved is to visit the group’s website and read about the commitment required to be an OSV. With the unrest in the world today, it is natural to be concerned about the people and animals in harm’s way. In the United States, our freedom, safety and stable government gives us the opportunity and the power to make a difference to help people and animals worldwide. It also gives us the chance to connect with people internationally who devote their time and their love to care for the world’s most vulnerable yet precious animals. CHRISTIE LAGALLY is a writer and the editor of Living Humane, a news site providing articles, op-eds and podcasts on humane-conscious lifestyles at livinghumane.com. 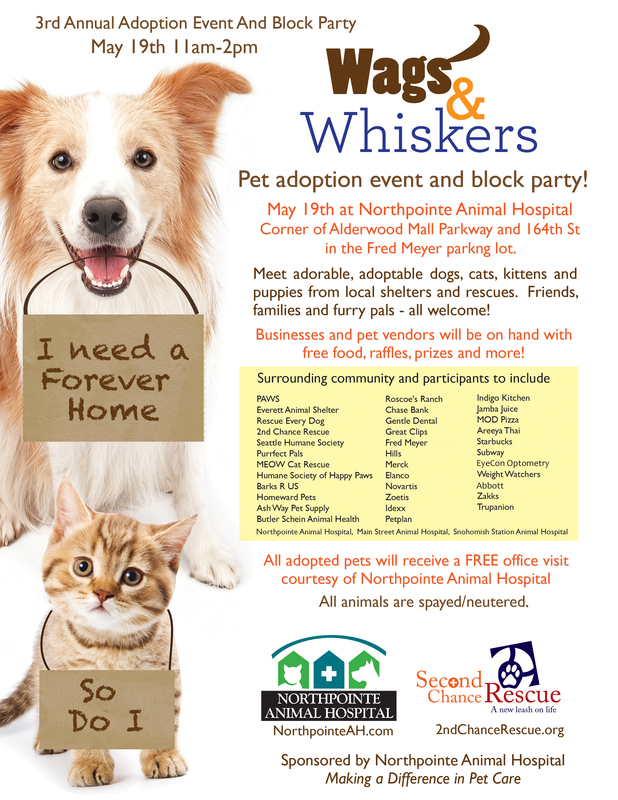 Adoption Event & Block Party with Second Chance Rescue – May 19th! On Sunday, May 19, 2013 from 11a.m. to 2p.m., Northpointe Animal Hospital is teaming up with Second Chance Rescue and over 11 other local shelters and rescue groups, including PAWS and Seattle Humane Society, to offer homeless pets a new leash on life at the 3rd Annual Wags & Whiskers event at the corner of Alderwood Mall Parkway and 164th Street. Everyone in the community is welcome to attend this adoption event and block party, hosted at Northpointe Animal Hospital. Visitors can meet adoptable kittens, puppies, cats and dogs from local shelters and rescues. Local businesses including Fred Meyer, Starbucks and Great Clips and pet vendors will also be supporting the event by providing free food, raffles, prizes and more. Experienced shelter staff, Licensed Veterinary Technicians and Veterinarians will be on hand to help people find the right pet for their family. The shelter staff especially has great insight into the behavior and temperament of each pet. All animals available for adoption at the event are spayed or neutered and all adopted pets will receive a free office visit courtesy of Northpointe Animal Hospital, Main Street Animal Hospital in Mill Creek and Snohomish Station Animal Hospital in Snohomish. Find out more at the Second Chance Rescue site.